Whether the dry hot summer has wreaked havoc on your grass, or if you're in a new property and need to start from scratch, Perth Gardens can install a gorgeous new lawn with no mess and no fuss. To give your new lawn the best chance at a long healthy life, our team of garden professionals prepare your soil by doing rotary hoeing to dig up and remove any old weeds or grass and also will level out and even the top soil as required. No need for you to spend hours doing back breaking manual labour, when our team is on hand with tools and expertise to do everything for you. 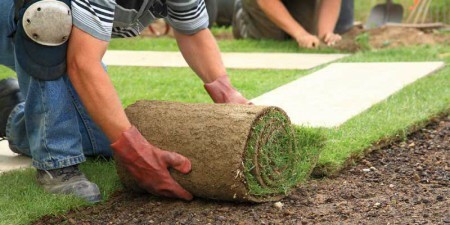 We use only the highest quality turf supplies and guarantee our work. Perth Gardens will only deliver your freshly harvested turf to your property when we are ready to install it. Careful planning and a team of hands to get stuck in will ensure that the process is quick and hassle free, with each turf roll installed with care and accuracy. We will begin watering when the grass roots are on the soil to promote growth as soon as possible. And don't worry, we'll tidy up and take all our debris away with us! Since we know so much about looking after lawns, we will take some time to speak with you about how you can give your new lawn the best care over the first few weeks of its life. We want to make sure that you feel comfortable and informed about how to keep your lawn happy and healthy through watering, fertilising, mowing and general maintenance. Can I trust Perth Gardens to give me a fabulous new lawn? Choosing Perth gardens for your turf laying needs is a great choice! Knowing that you are putting your trust in experts that have been doing this for years is crucial and we welcome you to be another one of our happy customers in our gardening community. If you're in the need for a new lawn, contact us today by calling 9468 8755 or send us a message mail@perthgardens.com.au to book in a consultation.